Through the introduction of some subtle lighting, skilfully picking out branches or lighting the whole tree, one can create a lovely ambience and bring structure and warmth to your garden. Trees vary enormously in size and shape, but most trees can be lit very well using fittings with 36° or 60° beam angles. 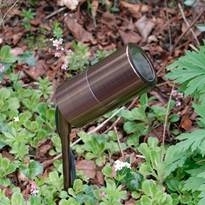 Narrow trees such as Silver Birch, Scots Pine and most conifers work best with a 36° light source. 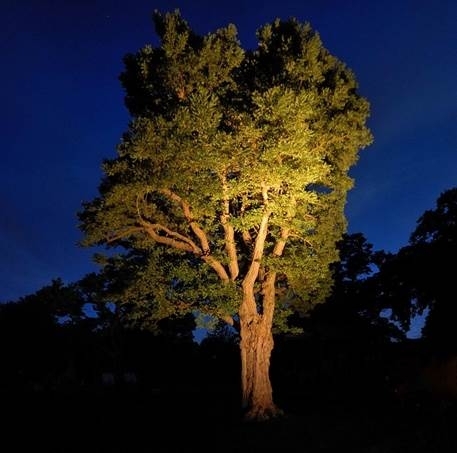 Medium spreading trees like Robinia, Cherry or Lime need lights with a 60° beam angle. While wide spreading mature Oaks and Cedars will usually require more than one light to achieve reasonable coverage. Extremely narrow subjects such as Italian Cypress could be lit using a very narrow light source, but in practice a 36° light will usually be effective. If a tree has an open canopy the light can be placed close to the trunk and pointed upwards to good dramatic effect. But where the foliage is dense it is better to light it up from the edge of the canopy. Grazing the outside in this way emphasizes textures and avoids the lower branches blocking the light from reaching the top. Good quality recessed fittings are available but surface mount fittings are easier to install and are more versatile. Ideally you should test out the lighting positions in the dark before making any final decisions. Unfortunately in the real world this is not always possible. But if you get it wrong it is much easier to move a spike mounted light than a recessed fitting. Make sure the lights are installed with a bit of slack cable to allow for adjustment. Larger trees require something much more energy efficient such as metal halide or led. Metal halide is a very good light source but it does suffer from one major drawback. The lamp must be matched to the control gear which means you can’t change the lamp brightness later on. Also the lamps can’t easily be dimmed. 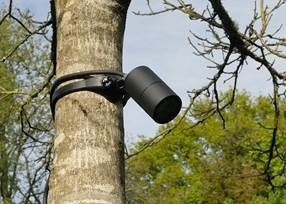 LED’s are rapidly improving and there are now led lights capable of lighting large trees. 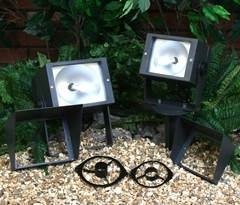 If you require a light with a very wide spread you could consider some of the new 30w, 50w or 100w led floodlights. But positioning them is critical as none of them offer any proper glare control. For lighting very small trees you might consider one of the Compact Spike Spots (available in 12v or 240v) with a 5w or 7w LED. If you need recessed fittings the Modula range of lights are a good choice; very solidly built with adjustable lamp holders which you can angle up to 30°, also available in 12v or 240v. If you are using 60° lamps it is worth considering P520B and Taurus spike spots which have excellent glare control while not constricting the spread of light. Slightly larger trees (3 -5 metres) need more light than you can get from a single spike spot. 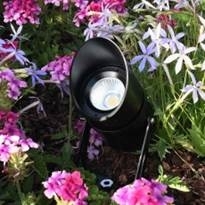 You could consider the Titan 10 watt LED 240v spike spot. Trees up to about 8 metres can be lit effectively using 35 watt metal halide lamps in spike mount or recessed fittings or some of the larger LED lights like the Titan 26 or the Athena recessed LED uplight. For larger trees we recommend 70w and 150w metal halide Apollo fittings.